How can you inject that added visual and acoustic dimension to your backyard aquatic project? 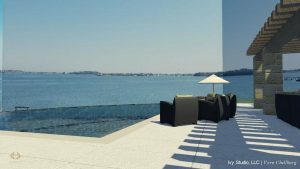 This is a question our design professionals at IVY STUDIO LLC, an outdoor environment consulting firm based in Massachusetts, grapple with when designing outdoor aquatic projects where a pool and spa are the focal point of the expanded outdoor environment. An idea that is gaining in popularity is to design a swimming pool with a vanishing, infinity edge section. To be most effective, the piece of land needs to lend itself to a design of this type. As a general rule, land that has a natural slope to it is more effective in the execution and the objective is to minimize the view of the catch basin from most critical site lines. Of course, the larger the piece of property and more open the views, the better will be the end result with the backdrop of the vanishing edge becoming the expanded viewing site line. Designing this feature involves a special talent and combines a number of complimenting skills. A working knowledge of engineering, hydro, mechanical, structural and electrical engineering is required. Added to this, visual and space conceptualization help complete the ideal back drop, which acts like the changing theatre and opera scene sets with natural lighting changes mimicking lighting in the theatre and opera, depending on the scene and mood depicted. The cascading vanishing edge and the associated sound it provides adds the acoustic dimension, much like the sound additions, spoken and others do in the theatre and opera settings. As stated, not every site or budget is best suited to a pool with this particular feature characteristic. If you have an appetite to incorporate a pool and spa with this unique feature into your outdoor aquatic design, look no further than our exceptional design professionals at IVY STUDIO, LLC. Contact us at 781-591-0300 or vern@ivystudioima.com to learn more about our firm and our capabilities.